Committee member Simon Wilkinson invariably pops up at events all over the place, usually to run, but regularly to act as a volunteer. He’s often seen marshalling at the parkruns at Halifax and Brighouse, and when I took part in the Jane Tomlinson Run For All 10K in Leeds last July, there he was again in his designer high-viz jacket. 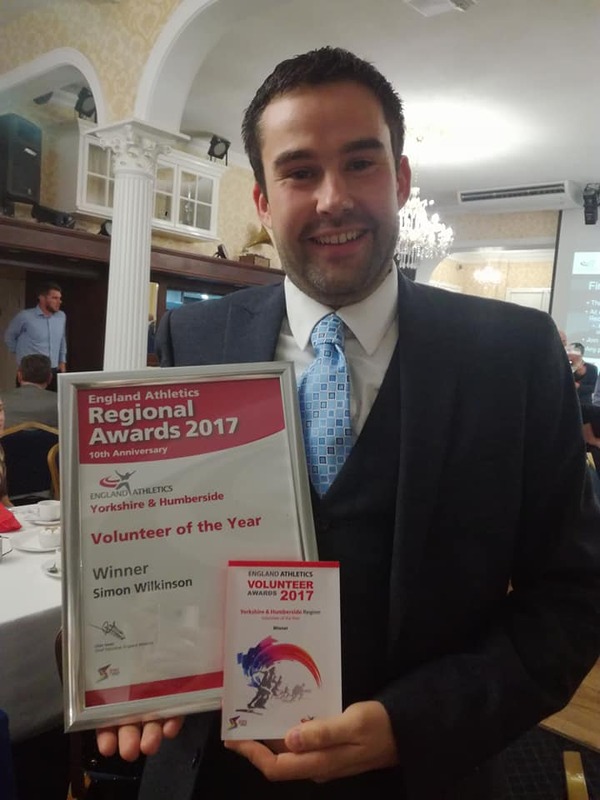 It’s actions such as these that saw him invited on Monday evening to the Kingscroft Hotel in Pontefract – ironically, just two days after he’d run the parkrun around the racecourse there – for the England Athletics Yorkshire & Humberside Volunteer of the Year Awards. Accompanying him was fellow committee member Ally Canning, but she, like Simon, wasn’t there for fun, nor just to be well fed. No, Ally was there to see Simon collect his well-deserved regional Volunteer of the Year Award, and how mighty happy he looked at receiving it, too, as you can see. 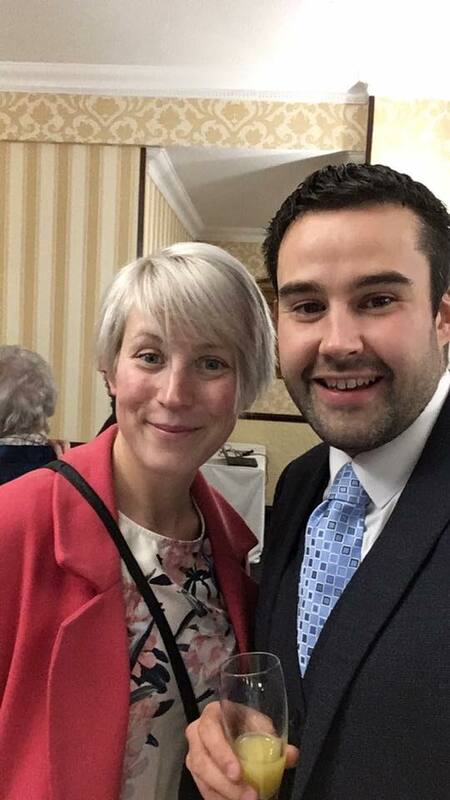 Ally Canning accompanied Simon at the awards ceremony and together they posed for what appears to be a pre-event selfie. Simon’s journey doesn’t end there. Being the Yorkshire and Humberside winner sees him go forward to attend the national awards ceremony event at the Ricoh Arena on 14 October. There, his winning entry will be placed alongside the other regional winners from around the country for the ultimate Volunteer of the Year award. Impressive, eh? Simon proudly shows off his award and certificate. Next stop, Coventry. We all wish Simon well and thank him for all he does for Northowram Pumas and everything else. There is, however, no truth in the rumour that he stayed behind in Pontefract to help wash up. Well done Simon – Who also found and returned my wallet at Neil and Jo Louise’s wedding! A real star and a credit to the club.